Analysis of the main principles of stratigraphy on the basis of experimental data is necessary to determine the hydraulic conditions that existed when the sediments, which have become rocks, were deposited. In this respect, the relation between hydraulic conditions and configuration of deposits (submarine ripples and dunes and horizontal beds) of contemporary deposits have been the object, especially recently, of well-known observations and experimentation. Examples are works of Rubin (Rubin and McCulloch, 1980) (Fig. 7) in a sea environment (San Francisco Bay) and Southard (Southard and Boguchwal, 1990) (flume experiments). Fig. 7. 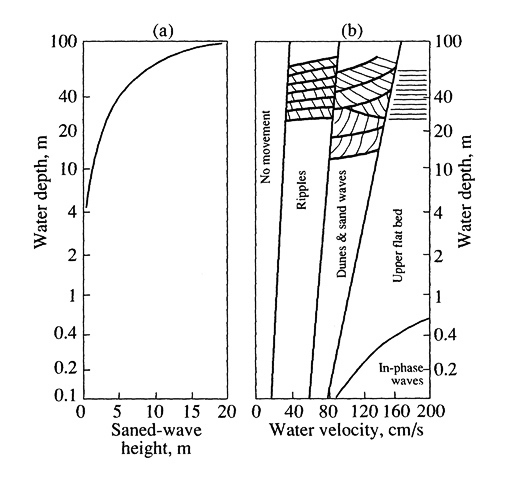 Graphs of (a) water depth vs. sand-wave height and (b) water depth vs. water velocity, showing bedforms in fine sand expected under different water conditions. The thickness of cross beds observed in fine-grained sandstone is used to estimate sand-wave height. Then, sand-wave height is entered into the graph (a) to estimate the water depth where the sand wave formed. After a water depth is estimated on graph (a), the depth is transferred to graph (b), where the minimum and maximum velocities of water are indicated for the specific water depth. Meanwhile, Hjulstrom and his successors (Hjulstrom, 1935; Lebedev, 1959; Neill, 1968; Levi, 1981; Maizels, 1983; Van Rijn, 1984; Maza, Flores, 1997) have determined a minimum velocity of erosion and sedimentation for each particle size at a given depth (table). These relations can be applied particularly to detrital rocks, such as sandstone, the first stage of a transgressive marine sequence resulting from a process of erosion, transport, sedimentation, driven by an initially erosive powerful current in shallow water. The competence, i.e., the paleovelocity of current below which particles of a given size deposit, and the corresponding capacity of sedimentary transport of the current can be determined. These two criteria determine the time for sequence to deposit. When the transgression reached its maximum depth and correlatively the velocity of current tended toward zero, the finest particles, transported initially by the transgressive current, precipitated at known fall velocities and eventually by flocculation [video 1 ]. It is, therefore possible, not only to appreciate the time the particles took to fall but, based on the capacity, to evaluate the time taken for the sediment to precipitate. Such data would, of course, only be minimum, but it would nevertheless give access to knowledge of the genesis of sedimentation.